His statement came at a press conference with Airbus CEO, Tom Enders, in Hamburg today, at the delivery of the new A380. 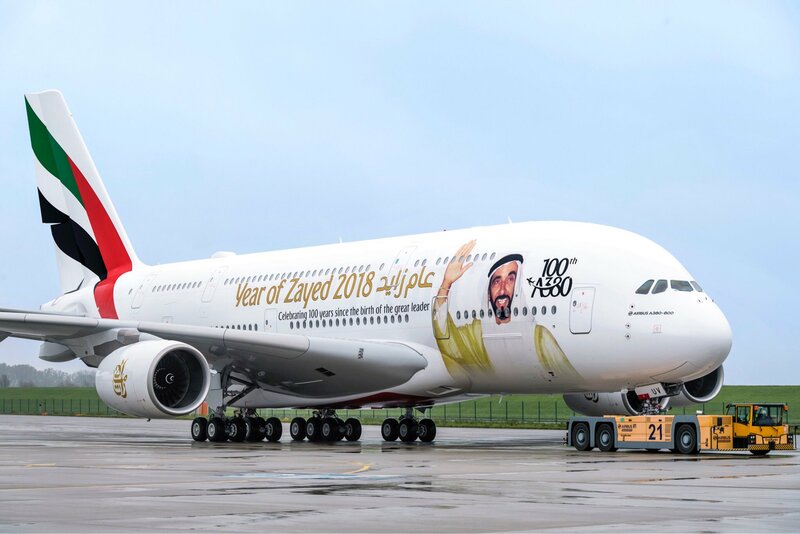 The delivered aircraft carries a special tribute to the founder of the Arab Emirates, Sheik Zayed (Figure 1). Figure 1. The 100th A380 delivered to Emirates Airlines today in Hamburg. Source: Airbus. When the question on additional A380 orders next week in Dubai came up, Al-Maktoum answered, “Ï hope we will be able to, we are working on it.” Such orders would then be the highlight of the Dubai Air Show, “as we like to place our orders there,” continued the Sheikh. Airbus’ Enders said he expects “the A380 to be in production for at least another decade” and Airbus is planning several improvements of the aircraft down the line. On a direct question, if this involves new engines, he answered, “probably. At some point, this will make sense”. Market intelligence says the Emirates order is for an additional 20-50 A380. The exact number and specification are not clear but it should be Rolls-Royce engined aircraft, which incorporate certain aspects of the A380plus package we described here. The very visual new winglets are not likely, as these involve extensive flight testing and re-qualification of the whole aircraft. Other parts of the package, like improved cabin items and systems solutions, could be introduced with less effort. The press event finished with the official delivery ceremony for the new aircraft. At the ceremony, hundreds of Airbus A380 co-workers and partners were present. Emirates was the first airline to place an order for the A380, in 2000. (Singapore Airlines was first delivery, October 2007, LNC). At the first Emirates delivery, July 2008 from Hamburg Finkenwerder, over 2,000 Airbus co-workers were present at the handover. The A380 has made a big impact on customer experience and what he expects from an airline trip. Its business lounge is the world’s most popular meeting point at 40,000ft, its first class SPA is unique and the spacious economy seats are a reference for the traveling public. 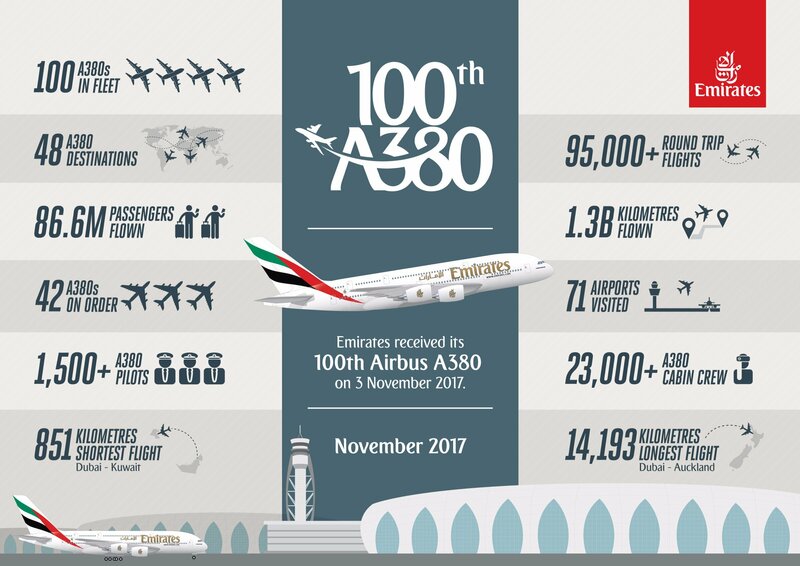 Emirates published this infographic about the A380’s achievements in its fleet at the event. So Airbus is going through this with the A350 where the change is barely visible but not for the A380 where the effect would expectedly be bigger? I suppose the decision would not be based on physics but rather on economy. Take a look at the number of planes still to be produced, the market and what it costs. Also, only because changes are more visible doesn’t mean it translates proportional into fuel savings. Will be good news for the 380 and AB. Won’t it be ideal if a new certification can be done with new engines and winglets. The RR Advantage are reported to be available in 2020, this could suddenly put some life back into the 380’s. I think the Advantage is as dead as a Do Do bird. Its now the heart of the RR GTF. All the NASA studies I have seen use the GTF for the one variation that had the best combined improvements. So, 2025 at the soonest and then looking for a hull to put it on. NMA would be their best shot. Thanks, tried to work out what was going on. Was confused for good reason, the “Advantage 3” seems likely to land up being just an updated XWB? The Advance looks like a combination of the ALPS LP system with Composite fan blades and the new RR core with shorter IPC and longer HPT with 2 stage HPT and single stage IPT. It will have ceramic matrix Composites in hot stationary parts, Ti-Al in LPT and have hard bearings as the T-XWB-97. So it is a RR answer to the GE9X. It will be the basis for the geared ultrafan “Ultrafan” having a new shorter high rpm LPT and a even bigger geared fan. The question is if the Advance core is that easy to scale down to a 40-45k application, you want a high core flow to keep temperatures low to survive 15 000-20 000 cycles but the TXWB size core is a tad too big for the 797 application. With 45k thrust and a high speed fan shaft you can reduce the size of the disk bores as the fan shaft gets smaller and get more disk Life out of the IP/HP system. Thanks, slowly but surely start to catch up on this. Just seems that the 797 economic’s will weigh heavy on the ultra-fans, availability 2015, then certification, etc. Hence can’t see the 797 really available to airlines in any significant numbers much before 2018? The 797 and probably the 322 economics seems to a large degree dependent on the Ultra-fan. Isn’t AB’s answer in the interim for a longer range single aisle an A320Plus (A321Minus), 15-20 seat shrink of the 321, wing updates, same MTOW and engines as the 321LR. Its OEW should be around 3T less than the 321 which should allow it to fly for approximately an hour longer with 160-175 pax if the 3T could be converted to fuel? One wing update for a long range A32x could be folding wing tips. Airbus may wait how FAA will certify these feature on 777X before making a design decision. My guess is Airbus will wait for the Ultra. I think the A350 NEO will be the first to get Ultrafans, if they do a NEO version that is. Realistically the Ultra-fan seem to be only available by 2025, so flying on a production aircraft by 2027? Put de-rated XWB84’s on an A380 NEO and let it fly in 2020/1 and then the 380-900 with ultra-fans in 2030? In the mean time Boeing will see how much further they can stretch their 777X sausage and run into ground clearance problems like the 737MAX’es with an ultra-fan for the 777X? It would not make sense for Airbus to simply put new engines on the current design of the A380, bigger decisions have to be made. The current version is a shorter variant of the never built A380-900, so it carries quite some unnecessary weight around. If Airbus decides to extend the life of the A380, they will probably agree on one variant, maybe a slight stretch, and optimize structure and wings to this design. Within this process new engines will be introduced and, given the certification hassle, it should be the best available. The problem is finding customers paying for it all now. Airbus, RR and Emirates want to do it but the rest of the A380 customer base don’t want to spend that much as only a few airliners now need the extra pax+range an A380neo will give. Some A380 customers are starting to densify it as they have enough departures sold out and refine the interior. Most likely the A380’s will have 2 cabin makeovers each adding 40-60 seats before they are ready for a neo. The winglet and aero tweeks in the A380+ are not that hard to certify, the major work will be when the neo comes with revised carbon wingbox, wings, pylon, nacelles, engines, a stretch to fill the 80 x 80m box, and more carbon & Al-Li in the fuselage, but to do that AI need 150-250 new orders. That will be one hell of a plane, but development costs could be almost that of developing a NMA or 322, 320+ and CS500 combined. Was wondering how applicable an XWB84 (de-rated) will be to a “simple” 380NEO? Will give also give engine commonalities to the 359’s and could be a selling point for both types. The only problem with the T-XWB is its mass. Too high to fit onto the A380, most likley they wait for the RR Advance that can be certified around 2020 and give 10-15% better SFC than the T900EP3. If 10% can be achieved with a NEO and winglet airlines will definitely have a re-look at the 380. The current list price of the 380 is only $30M more than a 779 but you get 50% more seats. Given that the A380 has 317 orders to date, why do you think an upgrade (even a big upgrade) would need 250 more? Really the number will depend on (1) how many Airbus can sell, and (2) at what price they can sell them. It will be even more ideal if development+cert for new engines+winglets cost nothing for the 380 program…….especially when production rate is now @ only 12 per yr so not many deliveries will split such cost anyway. What is this? Do U mean RR Advance(which is basically an engine core but not a whole engine)? surely not a 30 minutes flight. The shortest regular A380 route was DXB-DOH (380km). Now history because of the unjustified isolation of Qatar – initiated by Saudi crown prince MBS. But I agree with everything else: Economy and First on the A380 is still the benchmark. With 20 new A380 orders Airbus will be able to keep the production line alive for additional 2 to 2.5 years. Which means Airbus can postpone the decision on the A380neo by 2 years. I think that’s their only option, eeek it out even if you loose money. Boeing was saved for now by the UPS order, gives them close to 3 years production and possibly 5 if the optional 14 are picked up. I suspect they will see some orders come in from the big AF outfits so maybe longer still. On the other hand UPS could cut short, not many orders and done in 4 years. If Mr Enders is looking at a minimum of a decade of production AND is also suggesting new engines are hung then this must be something in the pipeline. I was under the impression that RR was looking at 2025 as the possible availability dates of something significantly better than the current crop of engines. Does this also mean that the GP7000 is now a dead duck? Hi Sowerbob, the Advantage in 2020 and Utra-fans 2025, see some links. 2 years doesn’t seem at all realistic to me. As I can make out the Advantage 3, a modified XWB, on schedule for 2020, the Advantage 2 (15-25KLb) later while ultra-fan 2025. The market for the A380 is so tenuous, there is no way you can do two engines, even one is highly unlikely. There would have to be a lot more orders to justify it, not a production rate of 6 a year. Am aware, I understood (from this forum I think) that the Advance is unlikely to make it to commercial reality so we are looking at the Ultrafan in 2025. What confuses me is the link between these technological approaches and the GTF, as I understand it the Ultrafan uses a GTF approach but is more sophisticated in having moveable fan blades. Is this approach what is being mooted for MOM sized aircraft as well or is there a further thread of research going into a smaller engine to compete at the lower end? P&W has the best data on that. I believe they were going to use it on the PW 1XXX for the A320 and then realized they did not need it as they could get their margins and efficiency without it. In the mechanical world its all about trade offs. What does the complexity get you, what is the market and if you can make it simpler and get all or most of the benefits, then you don’t do it. Right now there is not likely a sure path. The NMA favors the single aisle where simpler is vastly better. Big engines are different, longer flights, longer payoff, fuel use and all that. P&W having the real world operating experience with the engine will have better insights. Same with the drive, P&W uses a star gear I believe, RR has a herringbone gear. Where is the cross over between one and the other? Bigger twins I think PW said they would change it. RR originally planned to develop the moveable fan blade technology as part of the Ultrafan project. But they canceled this plans. So you could think that the Advance is on an in-between product to develop the Ultrafan, but to me it actually looks like a significant enough upgrade to the Trent, with its Carbon fan and housing and significantly increased bypass and compression. It’s still a three spool design, so their low pressure turbine can turn somewhat slower than on a 2-spool engine, which is why it should be outperforming the GE9X for example. I wouldn’t be too surprised to see the first Advanced being built soon and entering the test phase, maybe next year already. The latest thinking seems to be to use the Advance core as the basis for the Ultra fan and there will be no stand alone advance. Big question is why would you do one then a couple years latter have a much better one? That is the way I see/understand things at the moment, that’s why NMA/MoM/NSA will only go into production once the UF’s sorted? An second generation PW1100G could be available by 2020 and have applications to a 321+. Apparently some shorter term benefits for the XWB’s resulting from this work? This is a bit of a puzzle here, as we have to look into three engine options. The first one would be the Trent 7000, which would fit in size and is now entering production for the A330NEO. But it’s only half a generation ahead of the Trent 900, and not that much more efficient, so I don’t think it’s worth the effort. The second candidate is the Advance. Its carbon fan was already been tested in flight, and the core is also on the test rack, so 2020 can probably be achieved. I think this is the best candidate for an A380NEO. My take is that Airbus is now waiting for the go from RR. Agree, the T7000 is the newest kid on the block. With the current low 330NEO orders this might just help RR to recover their R&D and bring down unit cost for the T7000’s. EK has not got “small” long range aircraft, a significant order for the 330-800’s, having the same engines as a 380NEO could rattle a few cages? …and There are “no” backlogs, time is money. And my take is that the A380 does not have enough backlog to justify any engine change. Eeeking it out is the right move, but if there is no life support ala Boeing with the 747? New engine is a pretty big program and it has to justify the costs and the idea is not to break even but make money. Who cares about the costs in case they will be paid by the engine manufacturer? I can imagine Airbus will announce the A380neo just around the time the first 777X will be airborne. RR has to care about the costs and if they can get a return on that with any other application other than A380 if it falls off the map. As the NMA is a much smaller aircraft other than design elements you can’t shift it down to there. RR is seriously deep into new engines and upgrades. They need to get some ROI. Airbus has now publicly admitted they will lose money on the A380 (in asking to be let off for the development subsidy repayment). This could (almost inevitably now) wind up being the longest running money losing aircraft in the industry’s history; they are unlikely to throw any euro’s at optional improvements that don’t bring in some sort of profits. Functionally, EK’s growth has been subsidized here by the European tax payors, and lenders who will simply be parting out large quantities of young-ish aircraft over the next 10-15 years. Someone in Toulouse has repeatedly assured us that this money will be paid back regardless,and it’s my understanding that he is correct.It would be great if someone could give us a totally independent and easy to understand take on this.EKs growth has also been subsidised by US military spending and,as US airlines pointed out, EXIM bank. Slightly of track here, with the 777X committed to GE engines wonder when they will have the equivalent of the RR ultra-fans available. With the current 350 wing mods under development and (~100 KLb?) ultra-fans an A350-2000 (30-40+ seats) could just become a reality and be a real challenge to the 777-9? @Anton: GE has exclusive supplier contract with Boeing for the 777X, -300ER and -200LR. Thanks Scott, so AB could have their nose ahead of the 777X with the potential availability (2025?) of the RR Ultra-fan for the 350-1000 and possible stretch? @Anton A350-2000/1100/8000 or whatever it’s being called this week is certainly feasible but the market demand for this size airplane is weak. EKs growth has also been subsidised by US military spending and, as US airlines pointed out, EXIM bank. Don’t forget the European Investment Bank (EIB). I hadn’t forgotten, nor Boeings tax holiday. The British government funds Boeing 787s as well! We and Boeing particularly obviously need all the help we can get! And are screaming about it. Same mechanism as funded BA funded C series, and was ruled illegal in BA complaint against BBD. That is certainly right, but doesn’t the risk apply to every single aircraft which is sold underneath production cost where the aircraft company profits from tax cuts or governmental investment assistance? And I’m not aware of a company which didn’t. On the other hand, the development subsidy repayment for A320 was much higher then expected. The more airplanes a subsidized program sells, the more the investor gets. In the end it’s a gamble like everywhere else, sometimes you win, sometimes you loose. You meant A380? The terms are the investor gets money AFTER a certain number are sold. That number is secret, so we don’t know. The A320 is returning we know, never heard on the A330 but as its not touted, unknown and the program has had so many upgrades (A330/310, 330 various version and now 330NEO) and what the terms for that were or are? In short, the success of the A320 has subsidized the rest. In the past Boeing got the kind of world norm subsides but now they too are on the public trough. As I heard Airbus talked a while ago to the governments once offering these credits to lower the payments for A330 and A320. These governments earn nowadays a lot for their investment. I concur, as I understood it govts, or at least the UK govt was encouraged to ease both A330neo and 320 payments as they had become quite excessive. What the upshot was I do not know. I would say any govt with sense (if they exist) would link A300/310 and A380 within that frame. I don’t think that that is right, I think that the government’s get their money back regardless. Having said that, I have yet to read a clear and easy to understand explanation of the situation. I think that its designed to be difficult to understand. Could be, but with oil prices creeping up, airport slots getting less, skies filling up maybe just some room opening up. A 650 seat A380NEO could start challenging a 777-9 on seat mile cost, and have more range. Return of the hub-hub instead of city-city or re-calibrating the balance thereof is on the cards I believe. The Transatlantic highway could see less taxi’s and more buses in 5-10 years from now? But remain well within a stable low range today if U care to actually look @ its historic trend over the past 2 decades. Even when oil price was ranging beyond US$100/barrel circa 2008 and 2011~14, 380 sales was still slow or nearly nearly non-existent. True for existing major hub airports with no room to grow. However, this do not account for other existing or newer airports worldwide which hv been far less busy or hv room to grow AND hv been getting new routes/frequencies including longhaul/intercon routes. In 2000 when 380 was launched, only about 10 N.American cities hv Trans-Pcf nonstop routes to E.Asia yr round. Today, there’re 20. Similar story on the other side of the Pacific especially in China when the super-congested PVG & PEK(Beijing is adding a 2nd hub with upto 2x larger capacity than PEK) are no longer the only Trans-Pcf gateways for the 2nd largest economy in the world. Only in some restrictive airspaces/corridors for shorthaul op which has little or nothing to do with longhaul birds like the 380 anyway but has everything to do with shorthaul bird upgauging such as 320Ceo->321Neo or 738->Max10…..
As a result, little or no mkt room “opening up” for current or future 380 variants dreamed up by U. To a lesser extent, similar story re 779 or any hypothetical 350-2000 though. RR UltraFan or new wingtips won’t reverse any of the above thx to where the mkt environment has been /will be heading towards. And in the current & future mkt environment, the mammoth task to try to sell 650seats per frequency is already challenging the biz case for 380Neo development in the 1st place. Relative seat mile cost against 779 is the least of the problem facing current 380 in which EK already operate a 615seat config. But still hv far less Rev$ cargo space in the belly than a 779 thx to a shortage fuselage(even a hypothetical 389) and baggage space provision for 650pax. A misguided belief I believe completely ignored the actual mkt trend over the past 3 decades. Most importantly, even if hub-hub will remain important, avg gauge size there will still remain unchanged or even shift a bit downward in general thx to more competitors joining the same game but away fm the same hubs. DUB-NYC mkt is a perfect but extreme example to illustrate. 40yrs ago, EI deployed 747 on DUB-JFK mainly because it had a virtual monopoly in the DUB-NYC mkt. Today when even Norwegian is serving the same mkt thru DUB-SWF by a baby Max8, EI is lucky to hv IAG support to get EU/U.K. connection feeds to continue to fill just a 333 for DUB-JFK….DUB-JFK hub-hub route will never ever see gauge size anywhere near a 747 again. Look @ history 5~10yrs prior to now and see how likely for your prediction “5-10 years from now”…. …I am not ignoring trends, but every trend has an end, its generally a circle with a wave pattern gravitating to the centre to maintain equilibrium, duration depending on the dipole moment of the trend. If the current trend of down sizing would have continued forever the CS100 will be the largest aircraft flying in 50 years? FLX as you seem to have great insight into many things what percentage of Transatlantic passengers will be transported with single aisles in 10 years from now? …and what aircraft will Delta go for with their planned 100 single aisle order? Did you see SIA is shelling out $850Million to refurb the interiors of 10 used and 6 new A380s? holy cow, you can buy 3-4 737-800s for the cost of the interior of one A380. no wonder airlines are considering scrapping them at 12 years vs refurb or selling them. Not sure about the maths, $850 Million over 16 A380s is a little over $53 Million per aircraft. List price of a 737-800 $98 Million so sale price maybe $50 Million per 737 ? Were you talking about used 737s ? A more interesting point is WHY SIA is shelling out that sort of money on their A380s, and why they are getting 6 new ones. For SIA it must make financial sense or they wouldn’t do it. Don’t write the A380 off just yet. Think the wheel is turning for the big birds? On 737 pricing, the cost of two MAX8’s and one 787-9 that Air Canada will receive this year is in the order of $132M, so Boeing giving away aircraft at the moment. But they are allowed to, want to make money on maintenance contracts. This could be short term gain long term for airlines? Don’t think/hope Delta will be caught out. MAX8’s could go for $<35M? Interesting, can you link to a source for that? Look at the Air Canada quarterly press briefing. In a hyperlink which I seem not being able to copy. The reasoning of SIA and other airlines that operate the A380 is that they have found out that they can sell tickets at higher prices than on the 777 or any other plane. This is an effect that is usually not taken into consideration, as only the airlines know how the specifics, while we have a much clearer picture on the cost. My take is that this trend is stable or even progressing with growing passenger experience. For the same route and across all 4 classes, U can always book a 380 flight @ the same fare as a 77W flight. I picked SIN-LHR as an example simply because this route is where SQ deployed the most 380 frequencies and I tried every mth on diff dates for the nex 12mths. Feel free to try a diff SQ 380/77W route on a diff date and pls let me know when your search yield a diff result. For the same route in Y, again no diff in fare and in fact, some 77W flights cost more than 380 flights. Of course, I understand this is due to peak vs offpeak departure timing as usual…not because the concept of type X is superior in comfort to type Y like so many folks hv subscribed(typically 380 lovers). This is especially revealing(i.e. more comfort vs more departure timing choices for consumer buy preference) since Y seat specs on 77W is very diff than on 380 in EK fleet. For the same route in J or F, there’s typically a fare diff 77W vs 380 as claimed by U and some 380 operators. But objectively, U wouldn’t expect no fare diff given that the J/F cabin specs on 380 are extremely diff than on 77W in EK fleet(e.g. only 1 of them has an onboard shower+lounge bar). By my premium seat design stds, their seat designs are @ least 2 generations apart on the same EK route. But for PR /media consumption by layman unaware of diff seat/cabin configs even on the same route flown by the same airline, yes, we can simplistically say airline can charge higher fare on 380 than 777….. These are effects I hope U are taking into consideration…. My take is the premise for this trend is already flawed to begin with….let alone predicting stability or progression of the trend. FLX there is a market out there that is prepared to pay a little bit extra. I avoid 77W’s (in 3-4-3) and 787’s like the plague when traveling in the back with the family on sectors of >6 hours. Boeing has repeatedly sold 737s for 20-25 million to block CSeries. Walsh said long ago that they are in the market for extra A380s, but only if they price is right. U conveniently forgot to mention that Walsh also said IAG is only interested in used 380 frames…..which has zip to do with future sales prospect for output fm the 380 assembly line @ Toulouse…. This original post was about used frames, wasn’t it? Anyway I read somewhere he was interested in frames which are cheap enough, new or used. BA is onto something and I have a hunch rebellious Delta may try it. A hunch which completely ignored or unaware of how many times DL senior mgmt hv commented about the prospect of 380 in DL fleet which basically boils down to this: 380 has no place in DL future fleet. In fact, many industry analysts believe DL is a key reason behind VS, a DL subsidiary, consistently display no intention to take delivery of any 380 in their firm order backlog ever since DL bought 49% shares of VS.
Google search for interviews of ex-CEO Richard Andersen re the subject of 380 to get a clue. Of course, your hunch may be superior/trustworthy than comments made by the actual airline leadership…. I reside in NZ but recently spent time working at Cochin(COK) new international terminal. This meant travelling AKL to SIN, then from SIN to COK, and return. On the odd occasion due to a late departure fro COK I was rescheduled on NZ 787-9 or 777. These occasion only confirmed to me that from a passenger perspective the A380 has no equal. Your ealier posts focus on past – predicting civil aviation trends is more about looking to the future. The comments below are from Ben Sandilands, who sadly passed away recently, depict a very different future for the A380 when a few more forward/creative thoughts are useed. “It is a possibility that there will be Scoot A380s (ex Singapore Airlines) in coming years as well, topped up with everyone who might otherwise have been tempted to fly AirAsia X wide bodies, configured for anything but wide bodied passengers, to Asia. However, if Hawaiian (for example) take on a couple & are seen to be making money with them, the floodgates will open & that second life will be assured. The clever thing will be to be the first (or very, very early) airline/s to make this decision successfully. A pre-owned A380 will be very cheap at the moment because the boneyard is the only other option. Once the second-user market is established, the price of a used airframe will strengthen, possibly to the point of matching existing airliners as a percentage of the new price.? You’re obviously correct about slot-constraints, when do you think we’ll see A380’s between Sydney & Melbourne.? Three a day in each direction from TigerAir or JetStar might vacuum-up a big share of the market & make some of the high-speed rail chat somewhat redundant. (the end-to-end stuff, not the places in-between stuff)? One that arrives before 8am, one that arrives around lunchtime & one that departs after 6pm. Moving between 300-500 economy & premium passengers & still not packing ’em in like a mainline narrow-body or economy class wide-body & doing it at flight times which would suit business travellers as well.? Both Qantas & Virgin have the slots at KSA which they could transfer to their low-cost cousins & losing just 3 slots (whilst keeping them in the family) probably wouldn’t be a massive loss to their overall scheme of things.? My prediction is that sometime in the 2030s we’ll have A380s doing Sydney-Melbourne. Through special fast loading boarding gates. I’m serious. If anyone had predicted A300s on the route by 1980 five years earlier they would have been certified. Similarly the use of A330s on the route, although that has subsided a bit as the big two (or 1.5) find more find more space for single aisles as other routes shrink. I don’t think rail breakthroughs will change the pressure on that route until the middle of this century. So far, what could have been new orders for large tranches of wide bodies may have been diverted instead into the cheaper option of reconfiguring existing middle aged jets with more seats than Airbus or Boeing ever thought likely. It has certainly increased the ‘utility’ from an accounting point of view of the 787 Dreamliners, and to hell with what that does to kneecaps and backsides. There are 777s in long haul service with more seats now than some A380 and many 747 configurations. There are some A330s in ‘service’ for want of a better word with more seats than Emirates for example puts in its tighter fit 777s. The more the total operating costs of a jet can be divided by increased seats the better the ‘metrics’ look. In theory. Those extra seats have to be sold. Inflicting pain on customers has become an accounting necessity for modern airlines, and it involves some pain for the aircraft makers too, since the carriers have been able to kick the fleet renewal can further down the road. Certainly further down the road than the next two or three bonus related payments to current airline managements, in general terms of course”. In a couple of weeks we’ll have an idea from Emirates if they think they can still make money out of new A380s. It would be interesting to see an order for 20 to 50 new A380s. Revamped and I wish them the worst with that magical Trent engine. Obviously what TC was talking about was promised performance improvements not head to head where the measly 2 Spool GP7000 was bearing them soundly on maint and economy of fuel . I wonder how many specialty boutique engine RR can do before they go belly up? Sowerbob: I really hate spin BS and the Trent being “so much better” than the GP7000 was truly it. No, I don’t wish accidents in any shape or from. The vaunted RR 3 spool being so efficient and all, the GP7000 beat it on fuel burn, reliability and maint costs. So rather than just say we think we got a better deal TC puts out that the Trent is 5% more fuel efficient than the GP7000. Yea, right, 5% improvement promised, if they are lucky it will match, extremely lucky it might be 1 or 2% better. So, yes I wish them highly unreliable and fuel inefficient engines. GE an PW did an amazing job on the GP engine, never worked together and they came out with a good reliable better than RR engine. Supposedly good work is rewarded, and it was until the TC backstab. And so far its proven to be a problem engine so TC can stick it in his ear. Yea I know they will get the kinks out of it, but its going to cost more than the GP, fuel burn will be the same. TC might think twice about sinking his company on BS spin. They have enough problems. And lots of AOGs on him. For airlines it is quite important which supplier is the one for the future and for some reason it appears that RR is willing to take a risk here and EA is not. For the A380NEO EA would have to offer an engine with carbon fan and casing, and as P&W doesn’t have it on the shelf, it would have to be the GE fan and the whole engine would become a GE9X/GEnx derivate. I wouldn’t be too surprised to learn that there is a contract between Boeing and GE that such an engine can’t be sold to Airbus. Or maybe GE just doesn’t believe in the future of the A380 and prefers not to invest. Whatever it is, the future of the A380 depends now to a large part on RR (and possibly on their Advance3 engine). I think you will find that the Trent 900 has been chosen by 10 operators to 4 (excluding Emirates where honours are fast becoming even), with something like this I am inclined to accept the market as the ultimate arbiter. I have no idea whether RR or EA charge more for their engines, I suspect neither do you. I would guess that one of the fundamentals in this decision was the willingness for RR to continue development, I am thinking that the Alliance has more difficulty in making an economic case for this investment in what always originally seemed to me to be a defensive move to cover RR. Also we have seen the increasing partnering of GE with Boeing and RR with Airbus. Do you really think the engines are/will be ‘highly unreliable and inefficient’, if it were the case I am mightily surprised that RR has been so lucky to sell so many. All I know is that RR does not have the advantage of a captive financing arm to benefit from in the sales wars. A considerable amount was made of the Trent blowing up out of Changi, a lot less seems to have been talked about the recent AF engine disintegration. The data discussed in AV Week by Emirates was that the GP got better SFC, better on maint. I don’t know if that means less degradation on the wing (efficiency drop off per Bjorn before overhaul needed) . Suddenly Emirates tells us the RR is 5% better. My take is that’s what RR promised if they got the engines. What GP would or would not have done was never published. I suspect it was we would improve it but we aren’t going to promise guarantee. Last report was RR was having serious issued with the new upgrade and it was not going well. That in my opinion is where the rubber meets the road. While ADs have some impact, often not. And the ADs don’t discuss the new not yet released or put into service RR engine. This is a different take from an article which suggest that EK is going 777X all the way? Time will tell. Saj Ahmad and his one man show — strategicaeroresearch.com — is a good candidate for being Boeing’s principal international propaganda outlet; seemingly on a mission to primarily spread FUD directed against Airbus. Emirates is equipped with all the data it needs and to those in the know, the Chairman and Chief Executive of this bellwether airline, His Highness Sheikh Ahmed bin Saeed Al Maktoum has long since been an admirer of the 787s vaunted capabilities – now he’s on the verge of gaining a true game-changing airplane family to help turn around Emirates’ fortunes in the face of recent economic and financial challenges. For sure, Emirates might order the 787 one day — and they may even order 787s at the forthcoming Dubai Air Show — but what’s interesting to note is that Saj Ahmad, apart from his “renowned talent” in gathering industry intelligence, apparently also professes mind-reading abilities. He just “knows” that the chairman of the Emirates Group, Ahmed bin Saeed Al Maktoum, “has long since been an admirer of the 787s vaunted capabilities” — which according to Saj, is why Emirates apparently will be ordering the 787 instead of the A350. What I do wonder : is he hard currency “sponsored” by Boeing? There was a similarly strange hit peace around after the AF engines “rapid disassembly” over Greenland. Turning that engine mishap into another “the skies are falling for the A380 and Airbus” work of deranged art. FWIW; IMJ you can get a pretty good insight into the corporate thinking at Boeing just by checking the tweets, blogposts and/or Forbes commentaries from Saj Ahmad and Loren Thompson. If this is true AB should think how much longer they must be dragged through the sand by ME while Boeing is sipping cocktails on the Dubai beaches. @anton. whiskey and beaches :: Appearances. B management back in the restroom will be anything but relaxed if you go by the renewed dissing campaigns and the ham fisted approach to “leveling the tables” for poor US. Hmmm, sounds rather evil bwahahaha! Thanks, suspected something like that. Must have a few Boeing ties in his ward-rope? This was of interesting and topical from Flight Global. When they do do a neo, I would hope they de-engineer the frame for the actual size, and not the stretch es -900 they originally engineered it for…. Thereby full optimizing the frame for it’s actual size. Less/optimised weight brings its own benefits along with engines, winglets, clean-up, and a more open/flexible cabin. You can drop engine thrust but you are stuck with the airframe. One area I never looked into was if the engine thrust was for 900 or they had growth built into the GP and RR types. Growth was built in, Saw somewhere that T-900 can go to 80klb. I guess you could say current A380 engines are really de-rated. Even more 380-900 mod weight penalties. What amazes me is that AB ever soldados 100, leave alone 300. I reckon A380-900NEO will be a killer if and when. Finish off AF/KL if they stick with their current way of doing things. Regarding the frame: What I have heard from a very close source is that Airbus has long since developed quite some weight savings already. But apparently they go a little too far for “silent” implementation. So they will introduce those together with the new engine. Shouldn’t that guy be waving a scimitar? RE TW: The growth is/remains amazing at DXB/DWC. I remain unsure how, outside of petro revenues, these airports are sustainable for 50+ years. Why does the world need to fly through Dubai, exactly? Nothing is actually built there, or researched/conceived in/near that corridor, from an IP/industrial perspective. Mega-twins (or even hybrid trijets) will at some point make it as irrelevant as turboprops stopping in Iceland in WW2. NY, Atlanta, Dallas, Beijing, etc. all make a lot more sense to me. There are only something like 1.4 MM Emirati citizens, and their birth rates have been plummeting. They invest massively in aviation, to be sure, but it could all evaporate just as quickly as it appeared. Seen some comments on Australian suites that pax are taking stopover flights in preferece to direct ones as they aren’t confident that they can stand longer ones in existing economy seating. Needs considering more as if you can’t full economy there is usually no business case for a service. Doesnt depend on how many citizens are in Abu Dhabi. The airport is now a major international hub, like Singapore and Hong Kong- which have similar smaller population. Some people may dislike to give to much information to US entities. A flight via the Middle East is less complicated e.g. computers are allowed on board (I know the ban is lifted by the US). The point about a hub in the middle is always an airline can fill bigger aircraft than point to point. With two airports on each side an airline would need 4 B787-like aircraft for direct connections and maybe 4 pilots on each aircraft due to flight time. A hub in the middle can reduce this down to 2 A380 sized aircraft with just 2 pilots on board. From a smaller airport in Europa maybe just 400 people want to travel to 20 different destinations within Asia. Even a 787-8 would be to big for just 20 passengers. With a hub in the middle one aircraft would carry the pax first to the hub and then sequeeze the few on an A380 with pax from other origins. There will be competition soon: Turkish Airlines and also Iran Air can offer the same system. The US does not have an acceptable concept of transit. Too many cases of “we don’t like your nose”. If not that your stuff gets snooped. Passengers from Europe are actively avoiding US transit. unpleasant. Its a convenient hub like DFW is for the US (and Denver, Chicago, Atlanta, SFO and LA. I voted with my petro dollars and got a fuel economical car. I can’t even control how my taxes are spent let alone the ME. Fantastic news! No matter what anyone says, there is nothing like flying premium class on an A380 and the premier airlines know this. They need this aircraft to be able to compete with one another. The 777-10 just wont cut it. Well not all routes justify an A380. And the only time I got top digs on a flight my company paid for it for some odd reason. One way I went cattle class and the other business back. As the long one was a Narita to SEA I appreciated it. All my other travels were in the back of the bus. I hope this comes off. Fabulous plane to fly. Even the older ones are still great flying. Recent trip has A380, A350 and 777 legs. 380 just great. They need to hang in for a NEO but not rush it! Hmm; I thought Emirates were down on where they wanted their commercial situation to be. I know that long term planning has little to do with short term sales performance, but I can’t help wonder what a new 380 purchase means to their 777x order. Any thoughts? They have offered Emirates the full package minus new engines. Full package includes weight reductions and the new winglets. Yes it does need certification. They have also offered Emirates the new engine. RR shares have added 7% in two weeks. Something may be in the air. I think Airbus will keep the A380 going for the market will turn up. Not enough to make a profit, but enough to reduce the losses. I suppose that if the market does turn up, it could turn up in a big way. Perhaps differing trans Atlantic corporate tolerances for taking a bet and profit demands could pay off for AB. In a growing market, bigger is definitely better. Having said that, Boeing bet on the 787. So they’re not entirely shy of taking a chance either. Probably has more to do with replacing older frames, the 777X will fill routes not needing so many seats. Well EK wants to be sure they can buy new A380 or something like 10 years later and in order to be sure – the A380 line must not close down – i.e. they are ready to support even the current – from today point of view – far from optimal model. They know well that if they do not support the continuous run the line will close and will never reopen. The people would be swallowed by other programs, the jigs dismantled…… They do want such a big plane in the future !!! A number of people have been saying as such for a while now. I agree. It must be a little worrying for Boeing. The A380, seen by many as a white elephant, ain’t dead yet. The longer it lives the more likely a mass market will emerge. Especially if there’s a neo or something near enough as makes no difference. And if that happens, Boeing has nothing to compete with it, not in size, comfort or sheer potential opulence (The Residence, showers, a bar, etc). I’m not hearing about anyone offering double beds on a 777x. No one is saying that the 777x economy cabin will be as nice as the A380 economy cabin. I was also one that said stop the bleeding, cut the 380 and move on. But where will the market be in 10 years from now? The 777X can’t be stretched forever, its already ~77m long. F0r comparison the 340-600 at 75m is already a really long aircraft, those that flew in it will know. The 380 (73m), 350K (74m), 747-8 (76m). Wing and engine limitations maybe give an 777-10 limited range. If there is a future 450+ seat requirement/s its all for the 380’s taking. Yes Boeing/airlines will push an 11 abreast 16.5″ seating, good luck to them! But apparently, the 350 can be stretched forever….into the mythical 350-2000. According to yr comments, Airbus and Boeing probably work under diff laws of physics…. Then a stretch of the 321Neo to create a hypothetical 322Neo must be a ridiculous idea given that the 321 is only 4.6% shorter than the smallest widebody ever created+produced by Airbus? Or diff laws of physics apply to Airbus vs Boeing? But somehow the same limitations do not apply to the hypothetical 350-2000? Or diff laws of physics apply to Airbus vs Boeing? Good luck waiting for such requirement to materialize in the future mkt….and hopefully before the 380 platform(i.e. nothing to do with new wing tips, engines, etc.) becomes obsolete. And yes, don’t forget Airbus/airlines will then push 10abreast @ 16.4″ seating on 350(10seats+2 aisles @ equal width each with 2 inches of armrest space across 221″ cabin width) or similar future variants, good luck to them too! An envisaged 350-2000 stretch seems to be around 3.5m? (to 77m). With re-arranged interior that could give a seating capacity of around 400 seats. For bigger than that there is the 380’s. An B777-10 could be stretched to 450 seats (81m?) …and after that, can’t be stretched to 500+ seats? How many airlines are flying 787 at 3-3-3 and 77W’s at 3-4-3, and how many are flying 330’s at 3-3-3 and 350’s at 3-4-3? Boeing engineered their cabin widths with this in mind to claim their so called better seat mile costs. Maybe economics should be express in square metre of available floor space mile cost? 1st of all, your own “envisaged”(a.k.a. dream) or Airbus “envisaged”? 2ndly, a 350 fuselage @ 77m length is quite a diff story fm a 779 fuselage @ the same 77m length fm a structural efficiency perspective. And no, this is not due to diff laws of physics but diff in fuselage diameter. In general(And I thought U knew about this kinda Physics 101 stuff given your profession in the mining industry and I don’t even major in any BSc), the larger the diameter of a tube, the longer U can stretch it in length. 777 fuselage is 4% larger in diameter than 350 – naturally, U expect roughly equal structural efficiency fm a 350(e.g. 350-2000) @ 77m length as a 777(e.g. 777-10) @ upto 80.1m length. But in op reality, nobody will go over 80m because it’s beyond ICAO Cat F limit. 779 @ 76.7m length with 414seats(2-class) adds 3.2m(or 40Y) and becomes 77J @ 79.9m(staying within ICAO Cat F) with 454seats. 35K @ 73.6m length with 369seats(2-class, no slim-line lav which is ridiculously tiny for longhaul ops and return some Y seat pitch @ only 30″) adds 3.2m(or 36Y) and becomes 350-2000 @ 76.8m with 405seats. In any case, the real world diff in seat count 350-2000 vs 77J will be more than 50seats again because Airbus and Boeing use very diff cabin config assumptions(e.g. @ least 15″ smaller seat pitch +no direct aisle access in J for Airbus). Actually one of my degrees had Theoretical Physics and Applied Maths as majors. Below extract from wikipedia re 350K stretch. Airbus is exploring the possibility of a further stretch offering 45 more seats. A 4 m stretch would stay within the exit limit of four door pairs, and a modest MTOW increase from 308 t to 319 t would need only 3% more thrust, within the Rolls-Royce Trent XWB-97 capabilities, and would allow a 14,100 km (7,600 nmi) range to compete with the Boeing 777-9 capabilities. This variant is to be a replacement for the Boeing 747-400, tentatively dubbed the A350-8000, -2000 or -1100. Within the June 2016 Airbus Innovation Days, chief commercial officer John Leahy was concerned about the size of a 400-seat market besides the Boeing 747-8 and the 777-9 and chief executive Fabrice Brégier feared such an aircraft could cannibalise demand for the -1000. The potential 79-metre-long (258 ft) airplane is competing against a hypothetical 777-10X for Singapore Airlines. For 330, I can only think of AirAsiaX, Cebu, Lion and AirTransat. For 350, none @ the moment but AirAsiaX is scheduled to do so. But none of the above is relevant because objectively due to diff in cabin diameter @ armrest height, it’s hard for U to argue against the fact that @ 9abreast, 330 is far worse news for Y pax than 787 and @ 10abreast, 350 is far worse news for Y pax than 777. So I don’t understand the point of yr question…. U mean like Airbus engineered the 350 cabin width with exactly 9 inches less than 777 yet plan the same 9abreast Y config popular for 777 @ that time “in mind to claim their so called better seat mile costs” than 777? But what about 350 vs 787? Well, it’s impossible for Boeing to plan 787 cabin width specifically against 350 because 350 program did not even existed for 2.5yrs after 787 design started. Just luv it whenever the kettle try to call the pot black…. More importantly, such data only tell half of the story anyway because they reveal nothing about the economics below that square meter of available floor space in the belly…. It’s not public info likely because the math behind it is very difficult(and may be boring) for the general public to understand. Correct. It replaced the 747s at SQ, QF, BA, LH, AF, KA and bunch of other airlines, but that’s a done deal. A credible quick answer to the A350 and A321NEO is now on Boeing list. Keesje, those should indeed be their priorities. Not completely or none at all. Never hv more than 380 x19 in fleet and per current plan, never will. In contrast, 744 fleet peaked @ around 40~50 @ SQ. What replaced the rest? Logic would suggest 77W x27 in fleet. Still hv 744/ER x11 in fleet but all 388 still in firm backlog officially postponed indefinitely(And CEO already commented QF won’t need these 380s on backlog). Also, specifically announced 744 x5 will be replaced by 789 x8 with 1st frame already arrived. Similar story as QF re freezing 380 fleet size @ 12 while @ least 744 x16 hv been retired….something else hv also replaced 744(77W). BA still hv 744 x41 and per current plan, their replacement will be far smaller than 380 and even 744. Similar story as BA freezing 380 fleet size @ 14 but pretty obvious that 744 was replaced by both 380 and 748i. Remaining 744 per current plan will be replaced by 779 or 359. Has 380 x10 in fleet with no more on order but had 744 x24 @ peak. Something else has also replaced 744 which obviously look like 77W. Never operated any 747 nor 380. In fact, the largest type ever in this CX subsidiary is the 333. Already answered 1st by 789, then by 78J and finally by 778/9 4yrs ago. Whether these are “credible” enough by your personal definition is a diff story…. IMHO, the 789 has been selling @ least as well as the 359 and probably partly responsible for the death of the 358. The answer is known as Max10 in case U missed recent news. Again, whether U like that answer is a diff story…. As for its derivative 321LR, I fully agree Boeing has no firm answer @ this stage other than “advertising” a dream known as MoM/797. The fuel capacity of the 35K is ~112 US gal per pax while the 777-9 is 126 US gal, the 35K will fly a couple of hundred Nm further with that fuel. Don’t need to be a rocket scientist to work out which will be the most economical. The freezing of orders most likely as a result of airlines not sure if the 380 production will stop. If there are positive indications that production could continue with an enhanced model things could quickly change. Boeing did their utmost best to advocate the death of the VLA’s. Could we see the 747-8 “Revive” in a few years as they want to do with the 767-300 when airlines start ordering 380’s again? 1st of all, I don’t know where your figures come from. 2ndly, the comparison won’t work if they are not based on the same cabin density/config and load per pax+bag assumptions e.g. Airbus brochure vs Boeing brochure. Finally even if assuming yours is an apple vs apple comparison, I still can’t follow your logic in how to translate diff “fuel capacity” into yr diff range conclusion. Agree because I need to be far more intelligent than a rocket scientist in order to work out the method U used for your conclusion…. FLX lets start making the (wrong) assumption that both aircraft have the same range. The 779 has 52K USG fuel capacity and can fly 414 pax X Nm with that, the 35K has 41K USG capacity and can fly 365 pax also X Nm with that. So the 779 requires 52000/414 USG/pax to cover X while the 35K 41000/365 USG/pax to cover X Nm. And in calculating the above it is 126/112 indicating that the 779 potentially burns at least 10% more fuel per seat than the 35K? 1st of all, the reason these 380 operators hv not continued to add 380 hv nothing to do with the potential end of 380 production. All cited(e.g. QF, BA, VS, LH, AF, SQ, MH, TG, CZ, OZ, etc.) they already hv enough(or more than enough in the case of VS, MH and TG) for the types of route they have and will have for the foreseeable future. 2ndly, the comments were made and the freeze in fleet size were implemented long before the industry started early last yr to speculate 380 production might end soon. U mean U hope “things could quickly change”. I recall there were “positive indications” that Airbus would launch 380Neo(yes, with new engine and similar wing upgrades) 2yrs ago and there was not yet concern re its production continuation. No one expressed interest except EK and thereafter, we’ve not heard Airbus mentioned 380 and Neo together on the same page/event ever since…. Can U pls share an example for the above with me? In contrast, I can clearly see Boeing hv been trying hard to advocate/sell a 400+ seater in the mkt scheduled to EIS in 2020 which by definition is also a VLA(Well, may be @ least by the old/outdated definition…). Many of these still operate 747’s, you think they will replace them and ageing 380’s with 779’s only? Listed to still hv 15 frames but 11 are Combis each with fewer seats than their 789. Listed to still hv 15 frames but the last was gone fm regular schedule since last mth. Listed to still hv 11 frames but fm nex mth when 789 start to takeover 744 on MEL-LAX route, only 10 or less will remain. Only 7 operators hv 6~10 frames still remaining in each fleet despite ALL of them had far larger 744 fleets just 5~10yrs earlier. 2 of them are scheduled to completely retire 744 nex mth. The problem is U didn’t realized the bulk of the replacement cycle for “them” hv long gone…..most 744s needed replacement were already replaced a long long time ago and typically by 77Ws. As for 380 replacement, its cycle is actually more similar to 77W…EIS for 77W was 3yrs before 380. Both are too early in their cycles for most operators to consider replacement but obviously except special cases like SQ and EK where they get rid of frames relatively young. Both are using new 380s to replace oldest 380s(i.e. fleet rollover) including this new potential 380 order by EK @ Dubai show….it is not for net expansion of EK 380 fleet. In the far future when 380 hit the bulk of its replacement cycle, I expect all will be replaced thru downguage to either 779 or 35K and I totally don’t expect larger variants such as 350-2000/8000 or 77J will ever be launched. There are still ~210 B747-400/8’s flying, assuming that 25% of these could be replaced by 380’s indicates a potential market for 50 plus say 50 outstanding for EK. To date 215 has been delivered over the last 10 years, if production could be maintained at ~1/month could push it’s life out to 2025 when the 380-900 could be in the works with Ultra-fan engines. So what will Boeing have to offer airlines in the VLA market other than the 777X’es in the next 15 years? Life is pretty simple at the moment. If as a passenger you want a comfortable flight then fly the A380 – the rest just do not complete. Try an EK A380 sometime in any class then compare it with any of the US airlines – you will see they just don’t come close. No, if BA weren’t worried Saj wouldn’t be posting about it. The fuel capacity of the 777X is 198000 litres, but at a MTOW of 352 tonnes that amount of fuel isn’t possible with 412 PAX. 198K litres is 155.4 tonnes. Therefore 351.5-155.4 = 196.1 tonnes with PAX. 412 PAX@95Kg = 39.14 tonnes. So OEW would have to be 157 tonnes. Predicted OEW is 184-188 tonnes. So 29 tonnes of fuel will have to go. Meaning 37K litres must go. We shall see, but if the engine is only 10% better then the wing will have to make one heck of a contribution. My own view is that the MTOW will need to be increased. The same logic applies to increasing the range further. Thanks, figures look like mighty close end of the day. The 350K maybe a 5% edge, but only real world figures will tell end of the day. To achieve that must have been costly for Boeing. In underhanded PR efforts. In making offers “that can not be passed up”. Boeing may indeed be doing that, on a number of fronts. However they cannot keep doing that; at some point they’ll have to make a major investment in new designs. If they keep selling old products at knock down prices, simply to stay in the market, then they’re going to exit the market quite violently at some point in the future. Develop or Die, as the saying goes. In the multi-decades strategic poker game of airliner development, the corporate governance mindset of the companies really, really matters. One of the players seems to be bluffing with an old, poor hand and doesn’t seem to realise that they can improve it by changing the way they play the game. They don’t have to wait for a good card to come around. Personally I think it’s founded in investor mindsets in different parts of the world. Europe sees outfits like Airbus as socially important as much as anything else; good employment, good business, deep reach into all sectors of society whereever there’s a factory, lots of people benefit, there’s a market for the finer things in life, and everyone’s happy. It’s a harmonious setup. Does it make a profit? Well, hopefully, at least now and then. If you took Airbus out of Europe, it would leave a big hole in a lot of economies. In the US, it feels like it’s just about the money. If I can make $1billion in 10 years time investing in Boeing (provided they don’t screw up again) or $10billion out of Apple in 1 years time, guess what? Boeing probably cannot persuade American investors to back them in big developments because it’s too long term, risky and the return simply isn’t that high. All Boeing has to do is fund its development out of shareholder buy backs. They could have two to three new aircraft on that. Its the short term thinking that causes a company to flounder. There is a balance and Boeing has fallen on the wrong side of the line. I have done some more research on reimburseable launch aid for the A380 and Transworld is right, there is some secret minimum number that Airbus has to build before it has to repaid. So, assuming that they are probably not going to make it, they will be under enormous political pressure to build as many as possible. As long as the losses are reasonably small, it’s well worth carrying on at least until they get near the minimum number,for political reasons. I think that the Hansajet stopped one short of the target for this reason.I think this is probably a more important factor than just hanging on hoping things improve. I am not sure I follow your logic Grubbie. I think they have a number of clear reasons to keep the A380 line open. In terms of losses per annum on this programme this is less than a rounding error in the accounts of Airbus. So much of the infrastructure in place is not easily reused as the A380 is produced in a very different manner to all other products ie they are far more unique from one customer to another, they assemble more in situ and hang the engines early on in the final assembly at odds with normal practice and they rely far more on land transport. By keeping the line ticking over they compromise any headspace for the B779 and offer the ‘jewel in the crown’ or flagship for any self respecting fleet. For example This is the only aircraft my children noticed as different when they have flown. If Emirates can make it’s model work they alone could keep the line going way into the future almost singlehanded with their new hub. And of course the only way to compete with an A380 is to have some yourself. It looks like what must have been tortuous negotiations between Emirates and Airbus have reached some sort of conclusion and with some certainty to the programme we could well see more orders from elsewhere. I thought the numbers had been reported somewhere. WTO paperwork, national parliament paperwork or some such. Couldn’t remember what they were so did a quick Google and found a figure reported in a thesis at http://wrap.warwick.ac.uk/54056/1/WRAP_THESIS_Shimada_2012.pdf. I haven’t checked whether they are referenced or accurate but they state (p. 101) payback beginning at 600 frames. Good God that’s hard work, but there is some interesting stuff in there. I’ll wade through it over the next couple of weeks. If it’s 600 it isn’t ever going to get paid back! IMU the narrative on when to pay back or not is Boeing’s. ref: your link, pp101 ? Under Airbus’s loan agreements with European governments, the first repayment threshold kicked in only when airplane sales reached 40 percent of the target total sales. Airbus started paying back the loan, but all that was due back at that point was 20 percent of the total launch aid for a given airplane. For example, by 2011, Airbus had received nearly $4 billion in launch aid for the “new generation” 550-seat A380. It had projected a market for 1,500 A380s, so had to sell 40 percent of the 1,500 A380s (or 600 A380s) before it needed to pay back 20 percent of the $4 billion launch aid received. So far, Airbus had sold just over 200 A380s. It was estimated that the market for the A380 was much smaller than the 1,500 A380s projected, and it was unlikely that the market was big enough for Airbus to be able to sell 600 A380s. Therefore, according to Boeing, the European airplane maker never needed to pay back any of the $4 billion in launch aid for the “new generation” triple-deck “super jumbo” A380. It has further argued that Airbus had borrowed an incredible amount of some $15 billion in launch aid, which was a no strings attached government loan, but Airbus has not repaid most of that aid1. 1) 1500 is the number for VLA passenger aircraft + VLA freighter aircraft. 2) Airbus always said they intended to achieve a VLA market share of at least 50 percent, over 20 years. Hence, deliveries of 600 to 650 400-seat-plus passenger carrying VLAs — i.e. not only A380s — from the mid 2000s to the mid 2020s was essentially the target forecast when Airbus launched the A380 in the year 2000. AFAIK, the forecasted break-even point in the original business case for the A380 was around 250 units. What is Reimbursable Launch Investment (RLI)? “Launch aid” is a term sometimes used by the US as a misnomer for royalty based financing granted by certain EU Member States in individual circumstances to a number of companies, including Airbus. Since its creation in 1970, some Airbus aircraft development programmes have been financed in part by royalty based financing, otherwise known as “launch investment”. This kind of finance works in the same way as commercial investments. — Member State governments advance money to Airbus up to the limit agreed with the US, namely 33% of the total development costs of a new aircraft model. – This advance is then repaid by means of a levy on the sale of each aircraft. – The sales target is based on a conservative forecast of future sales, which is established when the investment is made. – The interest rate reflects the investing government’s objective to earn a good return on its money. It is always in excess of the government’s borrowing rate (i.e. typically 6-8% nominal) and may be considerably higher, depending, for instance, on the anticipated commercial success of the project and on the Member State (Some Member States insist on a higher return). – Once the actual sales exceed the target, as has happened, investing governments continue to collect “royalties” or “upside” on the additional sales, which will further increase their rate of return. the investing government) rather than a certain element of risk inherent in any kind of investment (in the present case insofar as payback is linked to the actual sale of aircraft). None of the individual launch investments granted by the Member States since 1992 has ever exceeded the limits, terms and conditions to which the US government agreed. In my opinion Boeing has much more of a case to answer, they haven’t refused to accept Japanese wing deliveries and tax breaks are not going to be returned in any circumstances. However, I am still not clear on whether the A380 loans will ever be repaid. It seems to me that the answer is no. As a British taxpayer I wouldn’t necessarily be unhappy about that, overall it appears that we are up on the deal and all those employees were paying tax. Might is right, the dirty deed will be achieved through massive corruption fines. OV-99: All I see is the same thing wrapped up in the same smelly wrapper. Bottom line is its free lunch aid unless its repaid. When I see an officially government document that is stamped and certified as to authenticated , all the numbers are speculation. Then Airbus comes out and says and dense packed A330 is a VLA. Somewhere there is a magic number of aircraft that have to be sold. All Airbus had to do was say they would sell 2000 and that ups the minimum required again. What the US accepted has nothing to do with it. It amounts to we can’t do anything about it so we accept it. When the US quit accepting it, it was repeated, and we don’t know what the figure are for the A350. Its no different than Boeing 8 billion from WA. Boeing just used US practices to do what Europe does. It all amounts to the same thing other than the fact that on top of the FLA, Europe also cuts deal within country that amount to WA type aid. Transworld,Boeings tax breaks are a straightforward gift,among many other gifts from domestic and foreign governments. EU governments are taking a genuine risk and getting paid a return for it. No problem, we can just transfer to the American method, problem solved. Airbus urgently needs to reduce its dependency on US parts, or they will be forever blackmailed by US interests. That’s protectionism does. Of course, if one chooses to reside in the land of the fake news cycle and the accommodating alternate reality, it would not be surprising to observe that some delusional individuals would have a hard time trusting any government publications. Trade and Industry Committee (Parliament of the United Kingdom), that would seem to debunk your claim that RLI-loans supposedly are not repaid and that they’re really nothing but a “free lunch”. 69. RLI payments are made for eligible development costs to companies in the early years of a project. Repayments, when paid, are usually based on a per-aircraft or per-engine levy. These are set at a level to achieve the repayment of RLI with a target rate of interest and within a specified period of time. 70. RLI is open in principle to any UK-based aerospace company. In the past, RLIs have tended to be large projects and relatively few in number. Since 1982, four companies— Airbus, Rolls-Royce, Westland Helicopters (now part of Finnemeccanica of Italy) and Short Brothers (now part of Bombardier)—have been provided with RLI. RLI has been granted to Airbus for the A320 and A330/A340 programmes and most recently for the A380 ‘super-jumbo’ programme (£530 million). Rolls-Royce has been granted RLI for the development of the RB 211 engine, the Trent ‘family’ of engines, and recently the latest Trent 900 engine (£450 million) for the A380. Westland Helicopters have also received RLI for the development of the EH101 military utility medium lift helicopter, while Short Brothers received RLI for the development of the Lear 45 medium sized corporate jet. The DTI has noted that all these programmes have either repaid at their expected rate of return or are on course to do so. Government expenditure on RLI from 1982 to 2003/04 was just over £2,039 million, while repayments amounted to just over £1,639 million. That is not a legal document, its a fluff piece that has not legal basis, its all speculative. Publish the full legal agreement that has signatures and stamps and dates on it. So, what you are saying is that an official document from the parliament of the United Kingdom is a fluff document and all speculative. I’m sorry, but that sounds like uninformed drivel by a crackpot and wild conspiratorialist. tradoc_146485.pdf – It’s biased towards Airbus but seems to be reasonably reliable. I think that was put together by Airbus during the WTO proceedings. Looks very familiar. The Japan number is quite interesting. Perhaps 40 years ago it could have been bearing the Trans World livery. A message to the avid anti – Airbus fan in the forum. One thing that I miss from the article and comments is wether the purchases are meant to add to the existing A380 fleets or to replace early models due to retire in coming years. Will have to see. Emirates has been all over the map on what happens with the older ones. Dr. Peters says they are going to part their out as they have more value doing that than a low ball sale. Not second market for them. No one wants the original ones as the latter ones are better. As I remember several early 787 did flew directly to a museum and several terrible teens were sold years later. At the moment the incredible number of 3 A380 are stored by buyers while 5 787-8 are on storage. Dr. Peters owns stored aircraft #3 and #5. #2 belongs to Airbus. To say there is no second market for the A380 is therefore to early. Delta just crossed my mind, they not shy of a second hand bargain. Know they worried about over capacity and down sizing but a half a dozen or so could fit in with the KLM/AF/Virgin agreement/s and routes? Bloomberg seems to think AA/DL/SW/UA investigation by SEC is due to common ownership issues, IF true DL management is not free to buy 600 seat aircraft because the real owners/managers, various hedge funds, won’t permit them to do anything which might adversly effect AA/UA/SW. But how? More specifically, how does 380, assuming to be deployed on DL intercon routes, fit into their current network model consists of distributing all intercon connecting traffic over 6.5 intercon hubs/gateways @ ATL, JFK, DTW, MSP, LAX, SEA, PDX(counted as 0.5 gateway)? DL(in fact, every U.S. Big3) network is totally unlike any current 380 operator which has no more than 2 intercon hubs each(typically only 1 hub except LH, QF, CZ and later NH)? U may ignore DL fleet history but the fact is that DL has not ordered anything larger than about 300seats(3-class) for over 4 decades. Even the 744s DL inherited fm NW were ordered by NW when they only had 2.5 real hubs(i.e. DTW, MSP, NRT). When DL planned their future flagship to be no larger than a 359 and given such a dispersed hub network, I hv an extremely hard time believing a 77W/35K/77X will make op sense for them…let alone used 380s even if acquisition cost will be dirt cheap. There are many city pairs that might justify an A380 . Tel Aviv – NYC for example is served by 7 to more then 10 daily direct flights ( 747 and big twins ). Direct flight cost about 30 to 50 percent more then doing the route by a connecting flight. PAX are willing to pay much more to enjoy the convenience and time saving of a direct flight. Airlines (like DL I guess ) are not convinced they will be able to charge them more to enjoy the convenience of the bigger seats and space of the A380. If we can keep the focus on the A380? BAE can’t get used ones at the price they want. Emirates is all over the map on what they will do with their first ones. Part out has been mentioned. So at this point I would clearly say there is no secondary market. There is almost no primary market. Secret source says 40 plus 20 options. Enough to mod the wing? Absolutely, and also all the other smaller changes. The really interesting question is the engine. It would be really cool to see the Advance3 on it, I just love those huge carbon fans. May I learn fm U what are the justifications/methods to conclude with “Absolutely”? An even more interesting question is why is it ‘less cool’ to see the same RR Advance3 engine core tech already applied on T1000TEN and scheduled to EIS on 78J only a few mths fm now?…. Which has nothing to do with Advance3 because that tech is all about the engine core. In terms of tech road map, I think RR hv made it pretty clear that their 1st application of carbon fan blades will be on the UltraFan and its related engines. If the love is truly for “those huge carbon fans” instead of championing a preferred manufacturer, no need to wait & hope Airbus/RR will eventually put them on 380 because carbon composite fan blades are already in airline service on GE90-110/115 since 2004, GEnx since 2012 and will be again on GE9X circa 2020. This is a thing that is easily overlooked, as of course the Advance is completely redistributes the loads in its core compared to the Trent. But, as a matter of fact, the carbon fan and casing is a major step for RR. Of course I do know that GE has pioneered the carbon fan. My company is making carbon fiber products, so this is surely a field of interest for me. And if GE had offered a smaller GE9X to Airbus, they might very well have accepted that, as it would certainly have been a significant improvement over the existing engines. But it looks like GE has decided to go with Boeing exclusively on this type of engine. Make no mistake, I really love those GE90 fans just the same. All that said, I think the Advance3 will be a great engine for a great plane. Oh, and about the wing: As you may have noticed, the development of the wing improvements is already finished, and as I have mentioned in one of my other posts, so are lots of other small and medium improvements. All Airbus need to justify certification is an available, more efficient new engine and a substantial order. You don’t seem to think that 40+20 will be enough? So, despite what you’re claiming, it’s pretty clear that Rolls Royce intends to put carbon/titanium fan blades on both the Advance engine and the UltraFan engine. As for your pro-GE rant, please do note that it was Rolls Royce that pioneered the titanium wide-chord fan blade, and which has served them extremely well. The fact of the matter is that until now, the technolgy was not ready to support making a carbon/titanium fan blade as thin as a RR-patented titanium hollow fan blade. In addition, GE has been using mostly a manual effort in laying up the fan blade profile on the GE90 and the GEnx. In contrast, the manufacturing of RR’s new carbon/titanium fan blades will be automated. You know, being first is not always an advantage…..
Now, perhaps the biggest advantage with composite carbon/titanium fan blades is that they just require a composite engine casing, rather than the curent titanium engine-casing in use on RR’s Trent-family of engines. That’s a major weight saving right there. Carbon-fiber composite fan blades tend to feature thin titanium edges, which give them the impact-resistance required for a bird-strike. Birds are not the only threat from the environment. “On composite blades, you need a metallic edge to protect the carbon-fiber composite, to deal not just with bird strikes but also erosion from the dust that is in the air, rain, snow and hail,” says Weeks. These factors “predominantly affect the leading edges of the blades, particularly toward the tips, which are the fastest moving parts of the blades,” he explains. Carbon fiber is used for the blades because of its light weight. But whereas it is easier to shape thin titanium blades for aerodynamic performance, composites tend to have thicker cross sections. “With titanium, you can make thinner blades, which means the aerodynamics are slightly better. You have to lay down many layers of composites to form a fan blade, and it is quite challenging to form aerodynamically efficient complex 3D shapes with sharp curves using composites,” Weeks stresses. As in the case of the GE9X, a composite carbon-fiber fan-casing can be employed if the blades themselves are carbon fiber. Composite fan blades just require a composite engine casing, rather than a titanium engine-casing, which also helps to cut engine mass dramatically. A carbon-fiber casing can be used because the impact on—and potential for damage to—the casing in the event of inflight fan-blade loss is much less than for a titanium blade. The Rolls-Royce technical approach to large-scale composite fan blade manufacture through CTAL has been somewhat different, preferring instead to invest in extensive automation in the layup of very precise tapes of pre-impregnated fibres to build up the required blade geometries of constantly changing thickness and shape. Hexcel’s HexPly M91 prepreg has been used by CTAL to manufacture DOVE demonstrator fan blades for new generation lightweight turbofan engines. Hexcel supplies HexPly M91 as slit tape which CTAL uses to lay-up the blade in an automated process that provides considerable design freedom in the placement of fibres just where they are required to carry loads. The result is as thin as a titanium fan blade – and lighter. HexPly M91 provides outstanding performance in this application, including very high toughness and high residual compression after impact (CAI). It gives improved tensile performance in combination with both intermediate modulus and high strength carbon fibres. Good tack life and out-life provide flexibility during processing on the shopfloor and low exothermic behaviour allows for simple cure cycles of thick monolithic structures without excessive heat build-up during manufacturing. Although GE’s GE90 fan established the place of carbon fibre composite fan blades, there was still mostly a manual effort in laying up the blade profile. Safran and Rolls-Royce, with their respective technology partners Albany Engineered Composites and GKN, have brought automation to the production process, giving an end product which is technically more efficient and with greater quality through repeatability. Thanks for those links, don’t know if the Ultra-fan is the be all and all end all for new aircraft. But can see a number of opportunities for such engines for AB around 2025-2028 based on current airframe modifications? A322 (new wing), 350-800 (wing mods/new), 380-900. …and very much a maybe, an AB “NMA” with 250 seats replacing the 330-200/800? Perfect between an A322 and 358/339. So we get a propagandas pamphlet from RR and or the mfg involved in the mfg of the blades. Hmm, shades of the same propaganda for the FLA.
As I said upthread, this sounds more like uninformed drivel by a crackpot and wild conspiratorialist. In a press release Rolls-Royce were merely saying that their composite carbon/titanium (CTi) fan blade prototype for the Advance and UltraFan™ engine designs had taken to the skies for the first time. Very interested to know the identity of your “Secret source”….hopefully it’s an entity related to EK or Airbus and not just guess work by some commentators keen on 380. It is an entity related to one of those named organisations. I’m guessing RR….but no need to answer that for the sake of protecting confidentiality for yr source. Well Tom Enders is going to need all the orders he can muster. It looks like he has ruffled too many feathers, been privy to too many misdemeanours (allegedly) and significantly is not French enough to last much longer. The knives are being sharpened. I get the feeling that all the shenanigans of the past any years could be coming home to roost for him and the senior management team. Not happy days at Toulouse, too many peoples in a questionable position. Tom Enders unfortunately will go and be replaced my a frenchman. The organisation is already top heavy with frenchmen. The whole philosiphy about Airbus and there success has been built around the different European cultures, the Germans with there precision and industrization skills, the Brits with there pragmtism, inovation and flexiblity and the good work Spanish, and then there is the French…………..the beauocracy, the process driven, inflexibility, programme driven. Airbus is just going to become a Citroen or Peugeot. Think outside the box, what about someone from China, and I am serious. Some of the top notch guys are really good. Wow. The ones that did the C919? Or the ones that did the ARJ-21? Must come from a construction or manufacturing background. Its time to turn things around, think outside the box. When those guys are good they the best to turn a company around. “When a companies fear of failure becomes more than its drive for success just leave the business”. Airbus should have a few more top management vacancies soon if rumors are true and the fine is 20Billion. Watch this space. Think I predicted this many months ago, B787-10 near perfect for the ME airlines. AB seems to be obsessed with range, 359 and 35K and now the 251T 330NEO, 80%+ needs are for less than 5000Nm’s. Maybe the 330’s can survive as a 330-1000, making use of the increased MTOW and wings capabilities.